If you are a teacher dealing with stress on a day to day basis, you may be working yourself to death! One way to minimize teacher stress is to create and manage small group classroom learning centers. Classroom learning centers will decrease the role of the teacher and increase the purpose of student learning. This will give you, as the teacher, more individual time with students. You will also feel a sense of relief as you are given more time to discuss student difficulties and you will be able to scaffold your students in their unique learning process. It is important when creating small group learning centers that you model how to behave in a small group as well as discuss the different roles within the small group. Sometimes, small groups may require that students change roles as note-taker, writer, problem solver, leader, etc. When students are working independently in small groups around the classroom, it is easy for the teacher to walk around and monitor student learning. Before setting up centers in your classroom, you must think about how you will structure your groups. There are two options for grouping. Homogeneous grouping is where each small group center has 3-4 students all with similar ability levels. Heterogeneous grouping is where each small group center has 3-4 students with one student being MIN, two students being MEETS, and one student being EXC. The exceeds student in the heterogeneous group will help lead and teach the group, which will also help the student understand the concept better. You may also want to give this student more challenging activities. Length of Center Time: Pre-K through 2nd Grade = 15 minutes, 3rd Grade through 6th Grade = 20-30 minutes. Center activities MUST be self checking. Have an answer key provided so the students can check their own work. Students must have something they hand in. Center work is usually not graded, as they will be able to check their work and fix their mistakes. You can take a weekly grade for participation. Have 4-6 centers around the room, depending on how many students you have. After the time is complete, have students clean up their center to its original state and rotate to the next center. 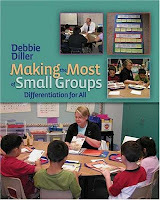 Making the Most of Small Groups - Differentiation for All by Debbie Miller. Great author who wrote Reading with Meaning. Literacy Word Stations: Making Centers Work - Another Debbie Miller classic that will get you started with centers!